Aston Villa's revival under Tim Sherwood continued as they hammered hapless Sunderland to pile the pressure on manager Gus Poyet. Gabriel Agbonlahor and Christian Benteke both scored twice in the first half to give Villa their first goals and win away from home since December. 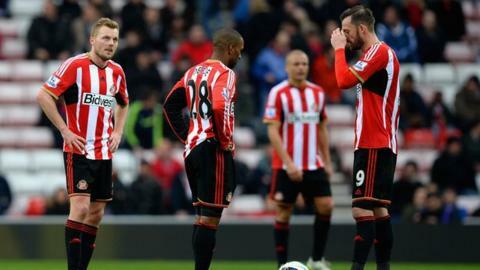 Sunderland, who have now won just one of their last 12 league games, were booed off at half-time and at the end. Poyet was targeted by unhappy fans with his side now deep in relegation danger. Villa, who have now won back-to-back Premier League games and advanced to the semi-finals of the FA Cup under Sherwood, had previously managed only four goals away from home this season. But they scored almost at will in an embarrassingly one-sided first half at the Stadium of Light which could have dire consequences for Poyet. Home fans started to leave after the third goal went in after 37 minutes. And some supporters had to be restrained by security staff as they attempted to get near Poyet - who sat impassively in the dugout almost throughout - as Villa went 4-0 up before the break. Sunderland's plight was summed up by farcical scenes at the start of the second half as they kicked off with 10 men before midfielder Seb Larsson limped out of the dressing room to rejoin the action almost four minutes after the restart. Patience had already been wearing thin on Wearside with Sunderland winning just twice at home so far this season. After replacing Paolo Di Canio in October 2013, Poyet kept Sunderland up last season thanks to a remarkable run of four wins in their last five games. But that momentum was not maintained and the Black Cats, with just one league win since Christmas and only four in total this season, are now only one point above the relegation places. Villa appear to be going the right way under Sherwood, a former team-mate of Poyet's at Tottenham Hotspur, following his appointment at the start of last month. The Midlanders looked highly impressive in brushing aside the feeble challenge of Sunderland to leapfrog their opponents into 16th and give their survival hopes added momentum. With Agbonlahor and Benteke reunited in attack, Villa cut Sunderland apart almost every time they went forward. Aston Villa substitute Rushian Hepburn-Murphy became the fourth youngest player to play in the Premier League when he came on in the 83rd minute. Hepburn-Murphy, aged 16 years and 176 days, replaced Christian Benteke at the Stadium of Light. Defender Matthew Briggs was aged 16 years and 65 days old when he played for Fulham in 2007. West Bromwich Albion's Isaiah Brown (16 years and 117 days) and Leeds United's Aaron Lennon (16 years and 129 days) are the other players younger than Hepburn-Murphy to appear. Striker James Vaughan - now at Huddersfield - is the youngest goalscorer in the Premier League when he scored for Everton aged 16 years and 271 days in 2005. The home side also failed to deal with the threat of Charles N'Zogbia and winger Leandro Bacuna. It was Bacuna's cross that allowed Benteke to side-foot Villa ahead after 16 minutes and within two minutes it was 2-0 as Agbonlahor gave John O'Shea the slip before beating Costel Pantilimon from a tight angle. Agbonlahor waltzed through Sunderland's porous defence to steer home the third and Benteke headed the fourth from another Bacuna cross to spark the unrest around the home support. Villa, who gave 16-year-old Birmingham-born striker Rushian Hepburn-Murphy a debut as a substitute, cruised through the second half with Sunderland denied a late goal when Steven Fletcher's effort came back off a post. Match ends, Sunderland 0, Aston Villa 4. Second Half ends, Sunderland 0, Aston Villa 4. Attempt missed. Fabian Delph (Aston Villa) left footed shot from outside the box is too high. Assisted by Tom Cleverley. Attempt blocked. Jack Rodwell (Sunderland) right footed shot from outside the box is blocked. Assisted by Danny Graham. Foul by Rushian Hepburn-Murphy (Aston Villa). Attempt missed. Connor Wickham (Sunderland) right footed shot from the left side of the box is high and wide to the right. Assisted by Sebastian Larsson with a cross. Attempt missed. Connor Wickham (Sunderland) right footed shot from outside the box is just a bit too high. Assisted by Patrick van Aanholt. Offside, Sunderland. Liam Bridcutt tries a through ball, but Sebastian Larsson is caught offside. Substitution, Sunderland. Danny Graham replaces Steven Fletcher because of an injury. Substitution, Aston Villa. Rushian Hepburn-Murphy replaces Christian Benteke. Steven Fletcher (Sunderland) hits the right post with a left footed shot from the left side of the box. Assisted by Jack Rodwell with a through ball. Substitution, Aston Villa. Andreas Weimann replaces Charles N'Zogbia. Attempt saved. Jack Rodwell (Sunderland) left footed shot from outside the box is saved in the bottom right corner. Assisted by Jermain Defoe. Attempt missed. Sebastian Larsson (Sunderland) right footed shot from outside the box is close, but misses to the right from a direct free kick. Attempt saved. Fabian Delph (Aston Villa) left footed shot from outside the box is saved in the centre of the goal. Assisted by Tom Cleverley. Corner, Aston Villa. Conceded by Wes Brown. Substitution, Aston Villa. Carlos Sánchez replaces Ciaran Clark. Attempt saved. Anthony Réveillere (Sunderland) left footed shot from outside the box is saved in the centre of the goal. Assisted by Liam Bridcutt. Attempt missed. Fabian Delph (Aston Villa) left footed shot from outside the box misses to the right. Assisted by Tom Cleverley. Delay in match Charles N'Zogbia (Aston Villa) because of an injury.